Also known as restricted party screening, OFAC screening, watch list screening, sanctioned party ownership screening, and sanction and embargo screening. The world of global trade is complex enough without factoring in the myriad of ever-changing rules and regulations that goes along with it. To aid in efforts to help organizations overcome these challenges, we've prepared some answers to the most frequently asked questions with regards to one of the most critical aspects of export, trade and OFAC compliance—that of screening for denied and restricted parties, and for sanctioned and embargoed countries. 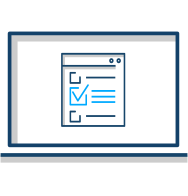 Now that you know what it is, learn more about which Denied Party Screening solution is right for your organization. We hope you find the answers to your questions below, but if not, please contact us today. Denied Party Screening is the process of identifying whether or not any parties involved in a transaction can be found on watch lists maintained by multiple U.S. government and international agencies. It helps to ensure organizations are not conducting business with a debarred party—be it an individual or a business entity. Depending on the methodology or screening solution used (e.g., Visual Compliance), screening for restricted parties can also help to ensure you're not unlawfully doing business with someone located in a sanctioned or embargoed country. What is the difference between denied party screening, restricted party screening, debarred party screening, OFAC screening, watch list screening, sanctions screening, embargoed country screening, Sanctioned Party List Screening (SPL), and Specially Designated Nationals and Blocked Persons screening? Denied parties: having a denied party designation typically means that entity has been denied export privileges. In some circumstances, you can do business with them, but if they happen to export what you've sold them then you would be in violation. 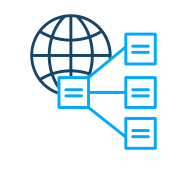 End User Statements, which certify on the buyer's end that they won't export or re-export your goods or materials can be an effective way to manage risk when dealing with denied parties. Restricted parties: these are individuals or entities upon which restrictions—either whole or partial—have been placed. For example, they are prohibited from receiving some items subject to the Export Administration Regulations (EAR), or a license is required in order to conduct business. In other cases, it may be prohibited to transact with them altogether. A restricted party is sometimes referred to a blocked party or entity. Debarred parties: these are individuals or organizations that have been blocked on account of a violation of the Arms Export Control Act administered by the Directorate of Defense Trade Controls. OFAC-related parties: these parties have been blocked as a result of the enforcement of U.S. economic sanctions. Individuals and entities, as well as sanctioned and embargoed countries fall under the purview of the Office of Foreign Assets Controls (OFAC). Some of OFAC's watch lists include Specially Designated Nationals (SDN) and Blocked Persons, Sectoral Sanctions, and Foreign Sanctions Evaders, among others. Do I really need to worry about screening for denied parties? Export-related restricted, denied and blocked persons lists such as the Department of Commerce Denied Persons (BIS), the Department of State Designated Terrorist Organizations, the Department of State Arms Export Control Act Debarred Parties (DDTC), and the Weapons of Mass Destruction Trade Control Designations (OFAC) lists. Sanctions programs-related blocked persons lists, including the U.S. Treasury Department's Specially Designated Nationals and Blocked Persons, Foreign Sanctions Evaders and Sectoral Sanctions Identifications Lists, and the United Nations Consolidated List. General Services Administration lists help organizations that depend on government contracts (i.e., SAM and EPLS) search multiple U.S. General Services Administration Lists of Parties to help identify those (e.g., suppliers and vendors) excluded from receiving Federal contracts. Law enforcement-related wanted persons lists, such as the FBI Ten Most Wanted Fugitives, FBI Most Wanted Terrorists, Department of Homeland Security Investigations Most Wanted, U.S. Immigration and Customs Enforcement and Removal Operations Most Wanted, and the U.S. Secret Service Most Wanted List, to name just a few. Politically Exposed Persons and Office of Inspector General Lists. International Terrorist, Blocked Person, Wanted, and Entity Lists, such as the European Union Consolidated List, Interpol Recently Wanted, OSFI Consolidated Lists, HM Treasury Consolidated List, and additional international lists from other countries, including Australia and Japan. If you do business with entities on these watch lists, you are potentially exposing your organization to the risk of export violations resulting in fines and other penalties. By making sure that you are not doing business with anyone on a government watch list, you are helping to protect yourself and your company from said fines, other criminal and civil penalties, denial of export privileges, and negative media coverage. Do governments outside the U.S. have screening lists? Are there International lists? Yes. The U.S. is not the only country that has lists similar to those maintained by U.S. government agencies. Many foreign countries and international bodies have their own laws which require the vetting of entities, including financial sanctions lists such as the HM Treasury Consolidated and the OFSI lists. Other international lists include the European Consolidated List, Europol and Interpol lists, Canadian Economic Sanctions list, and too many others to list here. Has anyone been found guilty of violating trade, export and OFAC regulations? Yes. A number of companies have been fined for knowingly and unknowingly violating trade, export and financial compliance regulations. In 2017, 31 individuals and businesses were convicted; and $287,102,532 in criminal fines, $166,234,123 in forfeitures, 576 months of imprisonment were handed down by the Bureau of Industry and Security (BIS) alone. A list of recent OFAC actions can be found here. Generally speaking, screening should be performed for every export or financial transaction, domestic and foreign. Ideally, screening should include every party involved in the transaction, including the final end user, and the chain of individuals and businesses in-between. Screening should also be used for any type of contact, including visitors, employees, business associates, re-sellers, etc.—though the lists screened may vary for each of these purposes. Countries where exports are destined should also be screened to ensure they are not currently facing sanctions or embargoes. Do I need to screen financial transactions? Yes. Every transaction facilitated in U.S. Dollars is processed through the U.S., and is therefore subject to OFAC regulations. Banks processing the transaction have an obligation to freeze funds from being transferred to sanctioned parties or face penalties themselves. To avoid this possibility, and a potential OFAC violation, screening is recommended. International financial agencies also have their own lists, so screening can help avoid fines and other penalties from global regulatory and enforcement bodies. When should screening take place? This can vary from organization to organization. Some may choose to screen potential customers or vendors at first contact. Some screen again when orders or finances change hands, and repeat this process with each order up until the time an order is shipped. 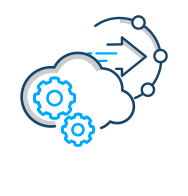 Other organizations have an automated rescreening system in place instead of rescreening manually. Visitors may be screened when they sign up for a tour, and again when they arrive. What is really important about when screening takes place is that it should fit the regulatory goals or risk objectives, of the organization—ensuring that finances, technology, information, or goods are not transferred in violation of regulations. 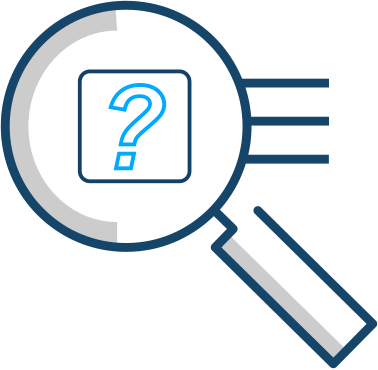 How does Visual Compliance help protect my organization from violating trade, export and OFAC regulations? How much does Visual Compliance cost? 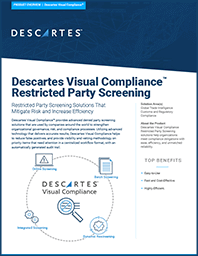 Visual Compliance screening solutions are affordable and modular, giving organizations the option to add solutions they need to get compliant right now, and the ability to add complementary solutions to bolster compliance should needs ever change. Contact us today to learn more about one or more of our screening solutions, or to request a quote.